Week Week- beginning and end. 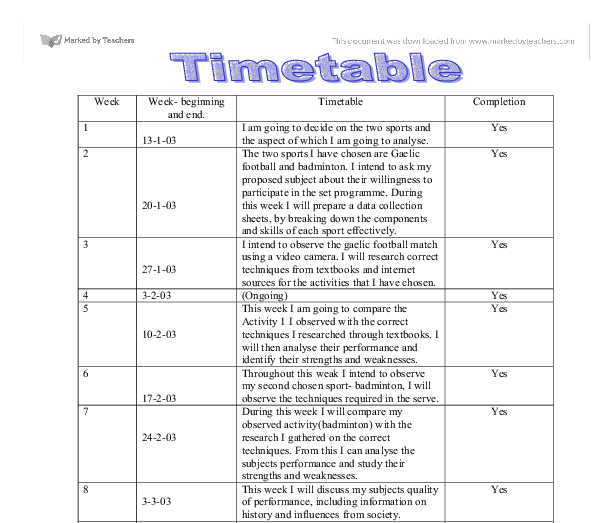 Timetable Completion 1 13-1-03 I am going to decide on the two sports and the aspect of which I am going to analyse. Yes 2 20-1-03 The two sports I have chosen are Gaelic football and badminton. I intend to ask my proposed subject about their willingness to participate in the set programme. During this week I will prepare a data collection sheets, by breaking down the components and skills of each sport effectively. Yes 3 27-1-03 I intend to observe the gaelic football match using a video camera. I will research correct techniques from textbooks and internet sources for the activities that I have chosen. Yes 4 3-2-03 (Ongoing) Yes 5 10-2-03 This week I am going to compare the Activity 1 I observed with the correct techniques I researched through textbooks. I will then analyse their performance and identify their strengths and weaknesses. Yes 6 17-2-03 Throughout this weak I intend to observe my second chosen sport- badminton, I will observe the techniques required in the serve. Yes 7 24-2-03 During this week I will compare my observed activity(badminton) with the research I gathered on the correct techniques. From this I can analyse the subjects performance and study their strengths and weaknesses. Yes 8 3-3-03 This week I will discuss my subjects quality of performance, including information on history and influences from society. Yes 9 10-3-03 I will attempt to explain the performers overall strengths and weaknesses. 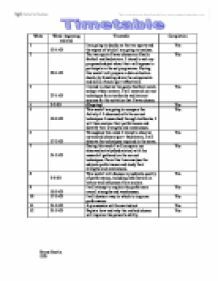 Yes 10 17-3-03 I will devise a way in which to improve performance Yes 11 24-3-03 A pre-session will be carried out Yes 12 31-3-03 Explain how and why the method chosen will improve the person's ability. Yes Activity one Badmington serve. Stance Main Service Contact Follow through Activity Two Gaelic Football Soloing Catching/handling Shooting Tackling Stance. o Feet should be spread apart, co-inciting with the breadth of the players shoulders. ...read more. Aerobic system takes approximately excess of three minutes for energy production as in Gaelic football. In badminton, the main predominant energy system is the ATP-Pc system. The speed and immediately that ATP can be resynthesised through PC is very important. In badminton, the serves or rallies rarely lasted longer than eight to ten seconds of maximum effort before a rest (through break of rally usually) occurred. The ATP-PC system is generally regarded where bursts of speed and power occur, as in badminton. There are a number factors that need to be taken into consideration before devising a training programme. These factors are a warm up, cool down, recovery, and a training programme should be related to a specific principle, i.e F.I.T.T Principle. The importance of Warm-Up The purpose of a warm up is to get your body moving, begin raising your body temperature, it will stretch muscles, move your joints and get energy pathways working so that the proper fuel is getting to your muscles. A proper warm up will prepare your body for the workout and will make the work feel easier than it would if you started out cold. A thorough warm up can reduce the risk of injury. It can assist the body to achieve a state of readiness for vigorous activity and enhances the performance of movement required for exercise. Warm ups can provide physiological benefits for the performance which has also lead to an enhanced performance. According to 'Wesson et al' * Warm ups can prepare the body muscles for the exercise activity they will be participating in. * Warm ups release adrenaline to the heart, therefore increasing heart rates, this means a greater level of oxygen will be transported to the working muscles by an increased delivery speed. * Increased muscle temperatures increase muscle metabolism and therefore ensures a readily available source of energy * A warm up will lead to increased body temperature, this will help to decrease the chance of muscle injury as there will be increased extensibility and elasticity of muscle fibres therefore leading to increased speed and force of contractions. ...read more. * There will be improvements in the buffering capacity of the muscle, which enables the muscles to tolerate lactic acid more effectively. * Increased capillarisation of the muscles. New capillaries may actually develop which enables more blood flow to the muscles and enables more oxygen to reach the tissues. * My performer will be able to lose weight throughout these training sessions. With all of these adaptations occurring to her body it should lead to an increase in speed, which in turn will improve her game by making her faster to the shuttle. There will also be some psychological adaptations which should occur if these training sessions are carried out properly. * If my performer loses weight, this will boost her confidence, which in turn will improve her game. * She should receive increased motivation, she should feel that she is being rewarded for her performance in the training sessions if they are carried out correctly. Overall this should improve her game, by making her more confident to go for the shuttle and strike a powerful shot. I feel that the sessions that I have planned are demanding enough to achieve an improvement in my performers speed. Over the six week period my performers speed will gradually increase. Her motivation levels should be increased and her level of performance should improve. Books * HONEYBOURNE, JOHN. HILL, MICHAEL and MOOR, HELEN (second edition) (2000) "Advanced Physical education and sport for A.S Level" By: Nelson Thornes * WESSON, KEVIN. WIGGANS, NESTA. THOMPSON, GRAHAM and HARTIGAN, SUE. (1998) "Sport and PE" By: Hodder and Stroughton Internet * Sports Coach Principles of overload online (1997) http://www.brianmac.demon.co.uk/trnprin.htm * Long S.E. The Fitt Principle online www.mbmc.org/health/Topics * Johnson J.G, Major muscles anterior and posterior view http://www.sirinet.net/~jgjohnso/majormuscles.html * Search Engines www.google.com www.askjeeves.com www.ukplus.co.uk Below can be seen a picture of all the major muscles in the human body ANTERIOR VIEW Below can be seen all the major muscles in the human body Posterior View Fartlek - Using a football pitch - Sprinting points Emma Devlin 13D ...read more. between elite and less successful athletes is that elite athletes possess greater self-confidence.' Gould et al. Bandura (1977) proposed that the self-confidence levels of an individual is dependent on the situation they are in and can vary from moment to moment. Australia's David Pocock because he consistently turns ball over for his team as he propels himself back onto his feet quickly and effectively. Results: If the tackle is executed well then it can be extremely effective, for example, the ball can be dislodged in contact resulting in a turn over through a knock on or interception. making contact with the bottom of the ball and 'scooping' it slightly rather than making contact with the middle of the ball as I aimed to do. This causes the trajectory of the ball to rise and the resultant shot goes off target. quickly as they are sticking by me constantly to prevent me getting the opportunity to shoot.In netball,it is vital to be able to move quickly,so this,i need to practice more to enable myself to challenge good defenders more than i do now.A perfect netball model would be incredibly agile and challenge all her opponents without struggle or effort. A joule is most commonly used to measure energy, one joule moves a mass of 1g at 1 metre per second and a kilojoule is equal to 1,000 joules. An ideal football player requires 55 - 60% of their daily calorie intake from carbohydrates, 15 % from proteins and 30 % from fat. The other weakness is my flexibility which can be a major part of football. For example sometimes I may strain a muscle when reaching for the ball because they are not flexible enough, which can hinder the performance of a game.